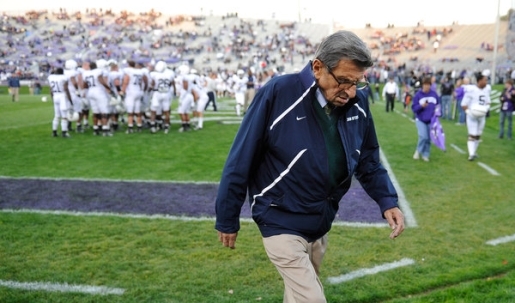 Joe Paterno faces the fight of his life. This just isn’t Joe Paterno’s month. First, his longtime assistant Jerry Sandusky gets accused of multiple counts of sexual assault and child sexual abuse by a group of boys, some of whom were affiliated with a charity for at-risk children. Then, Paterno loses his job in the middle of the season, sparking riots among Penn State’s students. Now, just when it couldn’t get any worse, comes more bad news. Joe Paterno has been diagnosed with lung cancer. Fortunately for Paterno, he’s got one of the more treatable forms of lung cancer, so while it’s pretty bad, it could have been a whole lot worse. Fortunately for Paterno, the lung cancer he has is a very treatable form of lung cancer, with a 70 percent survival rate over five years. Given the fact that Paterno is 84 years old, there’s no good form of cancer to get, but Paterno’s doctors believe that given the older fellow’s hale and hearty health, he’s got a very good chance of survival and his doctors are confident Joe Paterno will make a full recovery.